You'll be staying in a simply furnished apartment on the Costa Brava, with a rustic living room and a comfortable seating area around the fireplace. You can swim in the communal pool. For sunbathing and relaxing, there's a pleasant communal enclosed garden with shade trees and garden furniture. The charming building consists of two apartments and a studio. 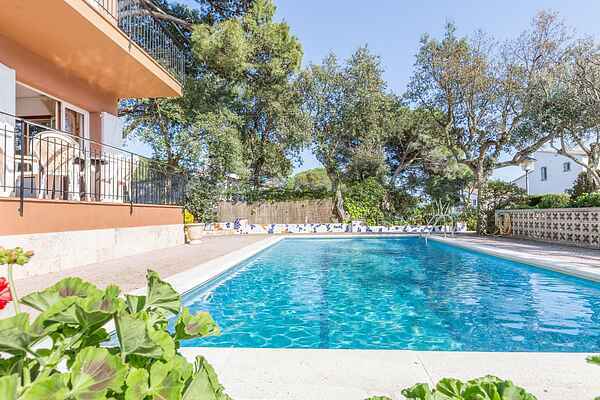 It is located in a residential area about 1.5 km from the beach of Calella de Palafrugell, 5 km from Palafrugell itself. The village and the beaches, situated in calas (coves), allure anyone who avoids mass tourism. From the promenade of Calella de Palafrugell, you can go for a fantastic walk along the coast to neighboring Llafranc (1.5 km), another appealing former fishing village. With its low-rise buildings, shaded promenade, pleasant outdoor cafés and beautiful beach, it radiates an easy-going atmosphere.